National Geographic is serving as the dissemination partner for Reach the World's exciting interactive GeoGames. GeoGames is a Flash game that lets you drag-and-drop onto the Planet Earth. 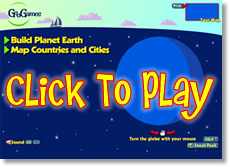 You can rotate your planet, test your geography skills, and print a copy when you are done! There’s a timer, so you can track your scores. 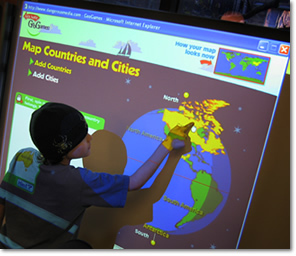 Try playing on a SmartBoard at your school if you have one – or play in teams! Check it out! GeoGames is also an app for Android and IOS – you can play on a mobile device! Click on the links using your mobile device to view the free and $0.99 versions of GeoGames. Reach the World’s GeoGames and the world geography mapping rubric are powerful teaching tools that turn geography instruction into an interactive, assessment tool for the classroom. Players construct an accurate rendition of Planet Earth’s major geographic features, along with a printable map. Easy to set up for the individual student or the entire class. Based on studies by researchers at Teachers College, Columbia University, this digital media teaching tool is a proven way to teach geography quickly and effectively. GeoGames is an educational tool being used by hundreds of schools and home users across the nation. Join our mailing list for news and updates on GeoGames!